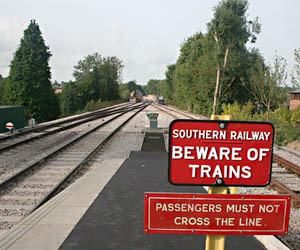 See also a trackbed tour from Kingscote to East Grinstead, and Lineside News. 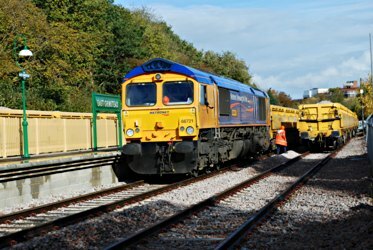 The July 'Waste by Rail' test run using GBRF trains to move the domestic waste to a Shanks landfill site in Bedfordshire was a success and went entirely according to plan. 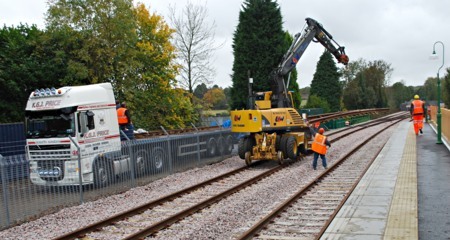 However it left the project team feeling there were still room for improvement in the train loading methodology at the Bluebell end of the operation which would not only improve efficiency but reduce costs as well. In view of the volume of material remaining to be moved, (around 115,000 tons) even the smallest reduction in cost to move the waste constitutes a valuable overall saving. 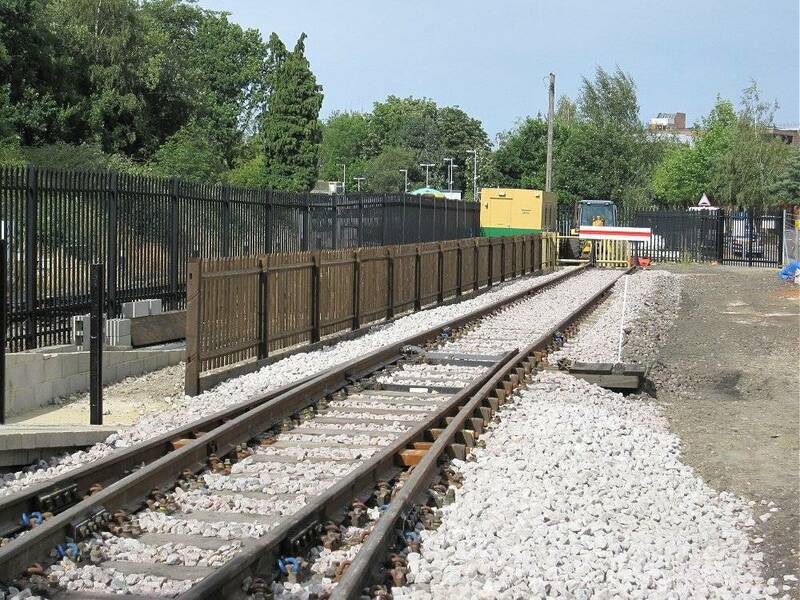 Consequently after evaluating a number of alternative loading options, a methodology involving direct train loading has been developed and work is now underway on site to prepare the necessary infrastructure to facilitate this approach. 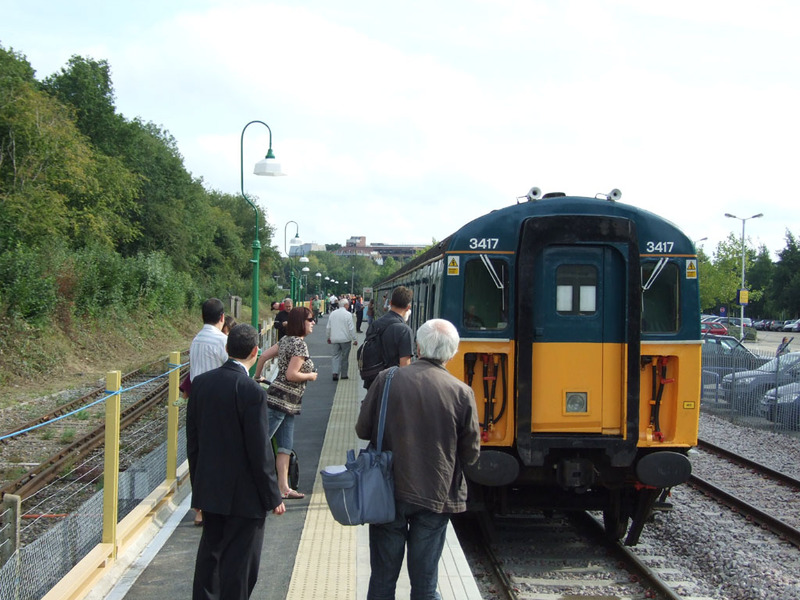 Bearing in mind the plan to run further waste trains this autumn has been well publicised, the planning work necessary to co-ordinate the resources, plant, trains and equipment required to make this happen have been underway for some time but have been frustrated by a number of difficulties. 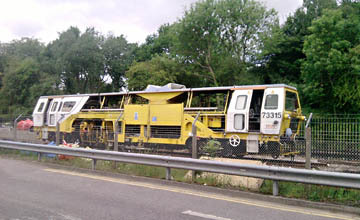 These include Network Rail possessions on the route used by the waste trains, availability of a wagon weighbridge, the need to divert resources onto other urgent work, repairs by WSCC to the occupation bridge north of Imberhorne cutting and finally the need to relocate the 4 VEP to enable plant to operate have all played their part in making it impractical to run further waste trains this year. 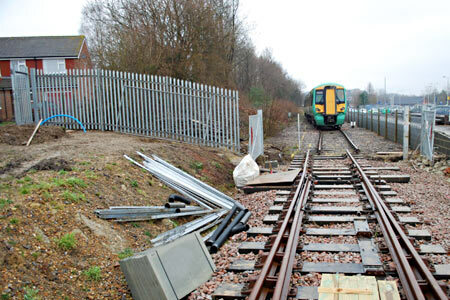 Consequently the intention is now to run at least 3 weeks of 'Waste by Rail' trains early next year in February/March. Although the exact dates cannot be confirmed just yet, we have a good 'window of opportunity' during these 2 months as our suppliers have confirmed they can deliver during this period. There is also the added benefit that we can extend the 3 week period if more funds come on stream by then and so gain economies of scale. 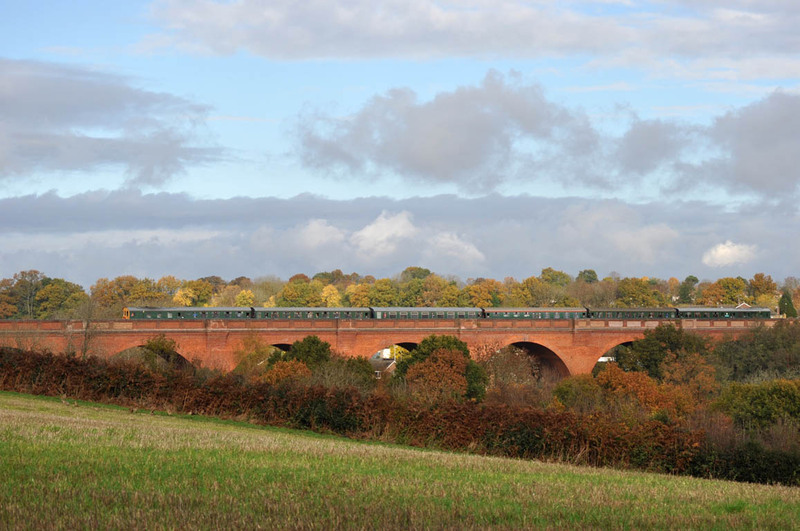 On the Saturday we hosted the Hastings Blue Belle excursion train, and were then able to offer train rides on preserved Hastings Unit No.1001, seen on the right in Ian Hall's photo on the viaduct, and below in Mike Hopps' photos. Ashley Smith also has a Video on YouTube of the event. 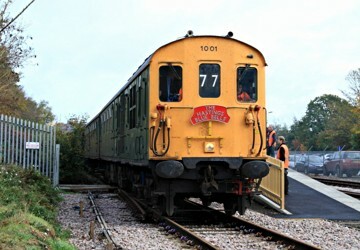 On the Sunday there were train rides in our VEP unit No.3417 "Gordon Pettitt" hauled by GBRf's Class 73 Electro-diesel No.73141 "Charlotte". With visitor numbers into 4 figures, the weekend was judged to be a great success, and raised a total of £4,800 towards the excavation of the tip. These photos (from Pat Plane) show what is currently going on on the Northern Extension. 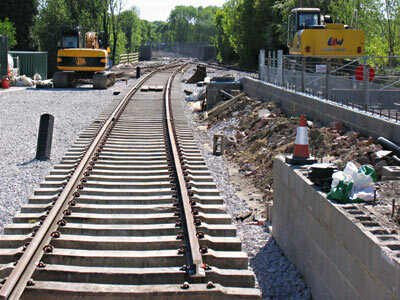 On the right we see the formation being levelled in preparation for the laying of track further down towards the tip. 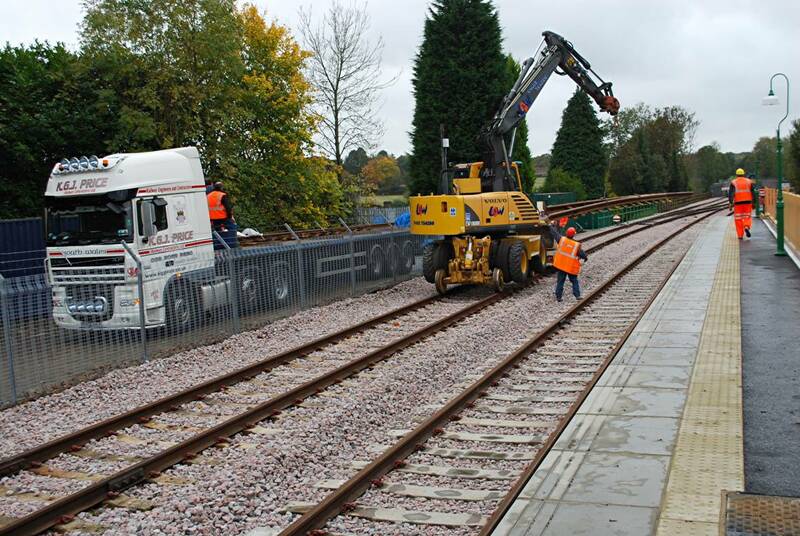 The photo below shows the delivery to East Grinstead of the pointwork which will be installed south of the viaduct to provide a siding. 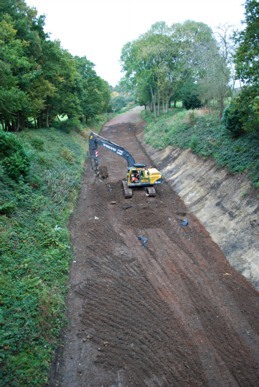 This work is to enable a revised (and cheaper) form of operation for the extraction of the spoil from the tip. It also has the advantage that it keeps shunting movements largely south of the viaduct, so greatly reducing the impact of the operation on our neighbours at East Grinstead. The two photos below taken on 30th October show 66721 delivered a consignment of ballast for the track laying at East Grinstead. 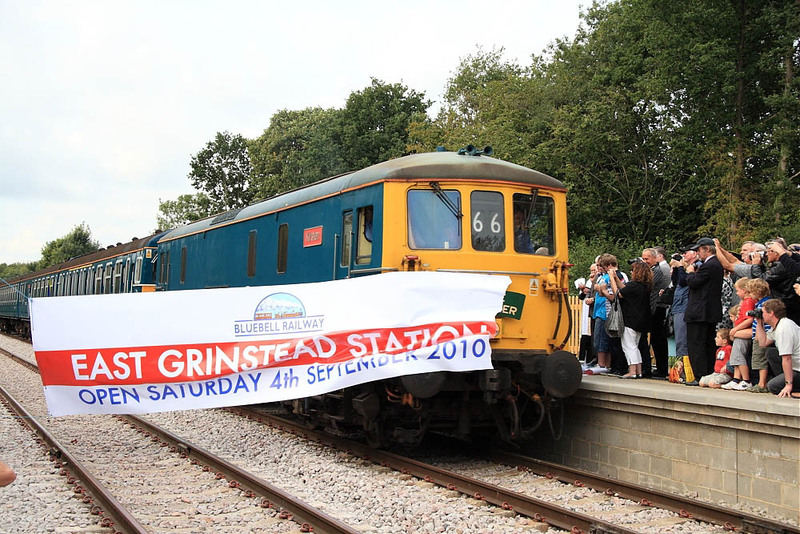 East Grinstead station platform was declared open on the morning of 4th September as seen in the photo, with the Class 73 electro-diesel and our Southern Region 4VEP electric unit carrying the first fare-paying passengers over the viaduct and down to Imberhorne North. 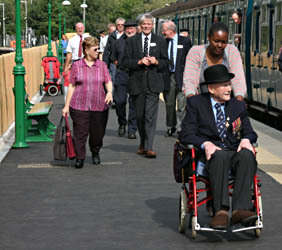 The first two trains were well filled, so an extra train was put on at 11.40am. There is a video showing the breaking of the banner, and Robert Philpot has a video taken on board the first trip. 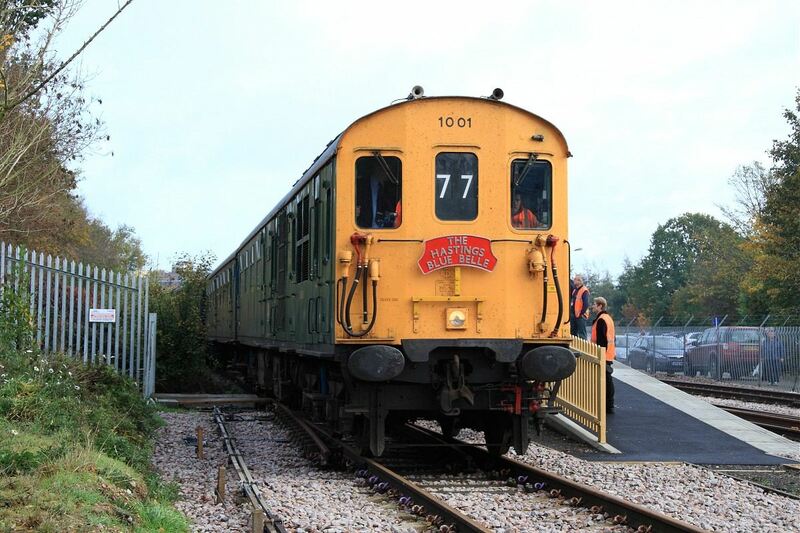 Ashley Smith's photos, which also include the Four trains which were running on the Saturday on the main part of our line, with the E4, the C-class, the U and 80151 all in action. 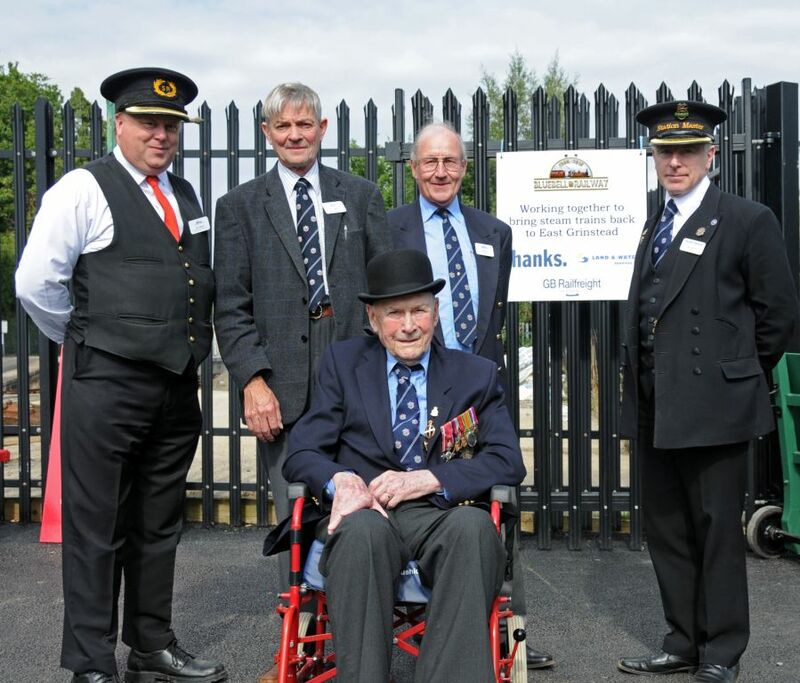 Also his video from the first trains in and out of our new East Grinstead platform on Saturday 4th Sept, along with another video showing the four steam trains running on the main part of our line that afternoon. Chris Dadson's videos recorded aboard yesterday's East Grinstead shuttle train showing the passing lineside and view from the viaduct: East Grinstead platform to Imberhorne Waste Tip (North) recorded on the west side, and Imberhorne North to East Grinstead on the east side. 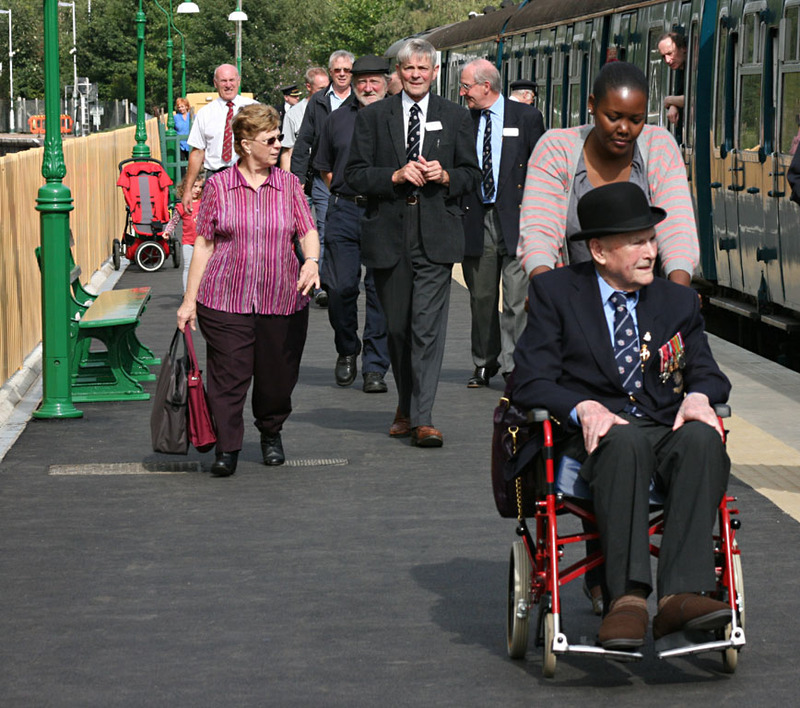 Derek Hayward's photos of the weekend include the President's inspection at East Grinstead on Sunday. 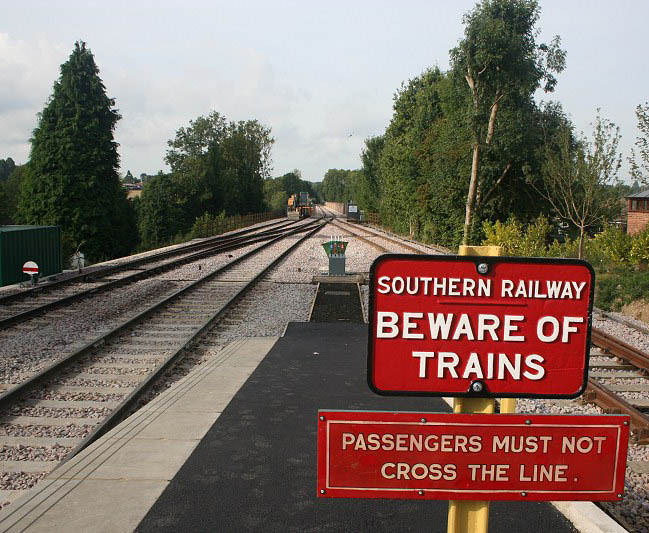 Andrew Strongitharm's photos of the opening day, and a new collection showing the line between East Grinstead and Imberhorne North for which Andrew received special permission to go on the lineside (this section is not covered by our normal Photographers' permits/PTS). 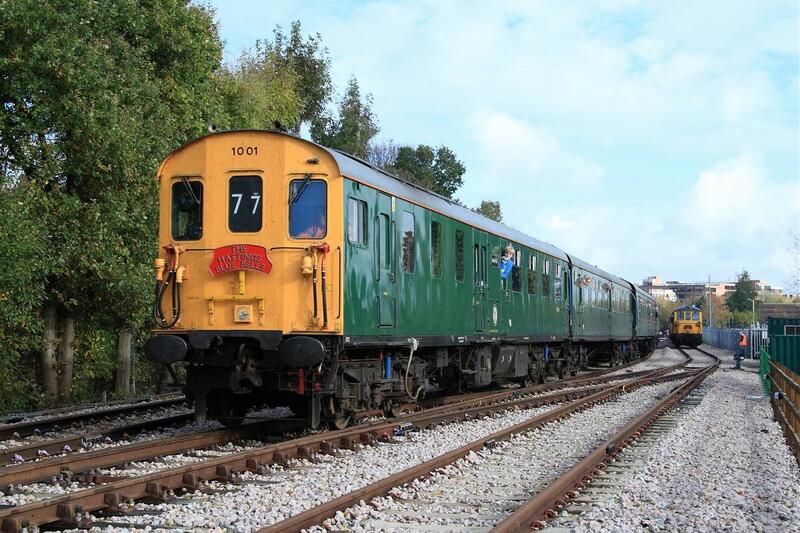 Matthew Nightingale's video of the 3.10pm departure on Sunday, and some other photos in his album of "Project East Grinstead". Video compilation of the first trip over the viaduct from Patrick Seale. From Patrick Seale there is also this video of 73208 and 4VEP 3417 working the 5L23 - 12-50 Eastleigh - East Grinstead on Thu 2nd Sep 2010, as it crossed Riddlesdown Viaduct. 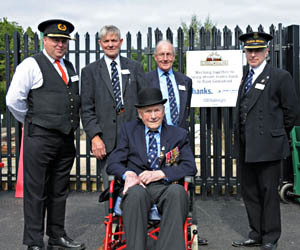 These five photos from Michael Hopps were all taken on 28th July. 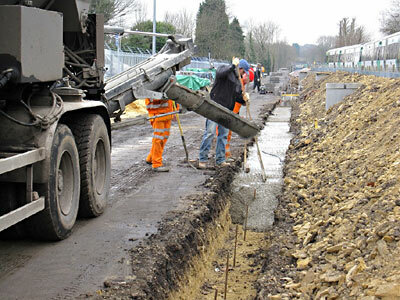 The first photo above shows the formers being assebled for the concrete to be cast (in the second) for the rear edge of the platform. 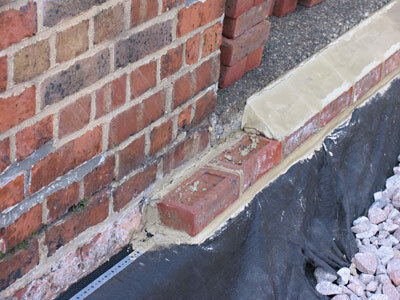 The photo on the right shows the fitting of the drainage channels in front of the coping. The platform slopes back to this drain, and the rainwater is harvested along with that from the viaduct. 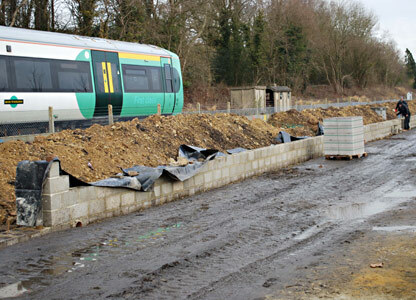 Below is a general view looking towards the temporary ticket office, and probably the only picture of the first platform-edge slab being laid, showing how it was positioned with the assistance of a gauge from track level. More recently, Derek Hayward has been able to update his album covering the current state of progress at East Grinstead, during the offical visit of the local Mayors to the site on Sunday 22nd August. 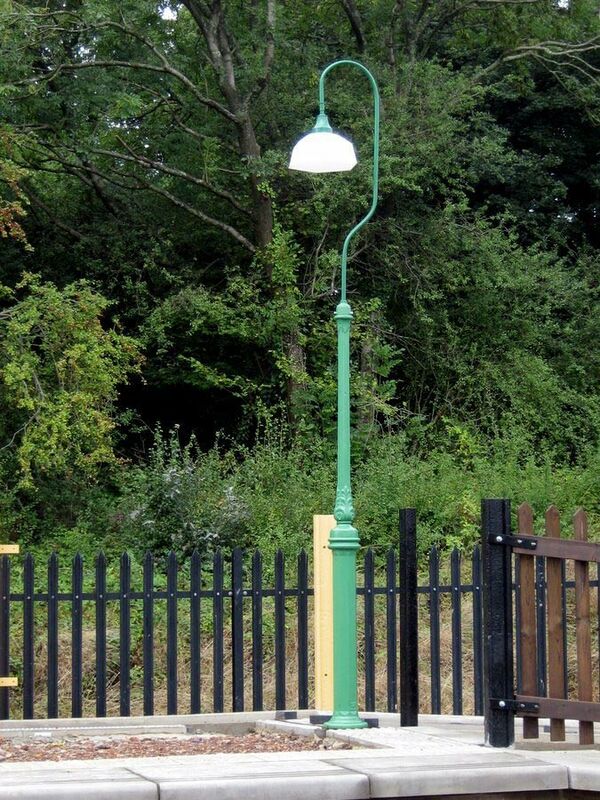 John Sandys has provided the photo on the left, taken on Thursday 26th August, as part of an album featuring the new lamps at East Grinstead. 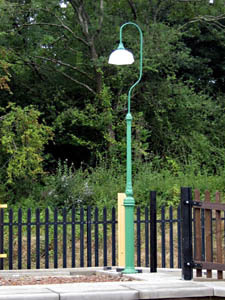 The new lamps, the provision of which has been organised by Les Haines and paid for by the Bluebell Railway Trust, are a mixture of salvaged and newly cast LBSCR-pattern columns, fitted with new SR-pattern swan-necks and original SR shades. 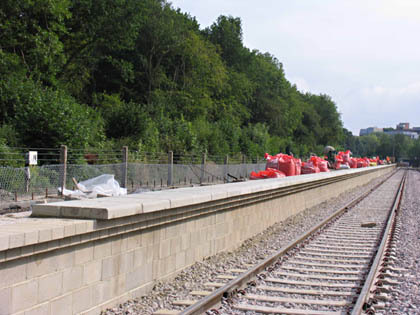 Extra columns were also cast for planned use at Sheffield Park. Trial week of tip extraction completed. The trial removal of waste from Imberhorne cutting took place 5-9 July 2010 and was very successful, so much so that it is hoped that a more prolonged dig will take place later in the year, subject to sufficient funding being in place. 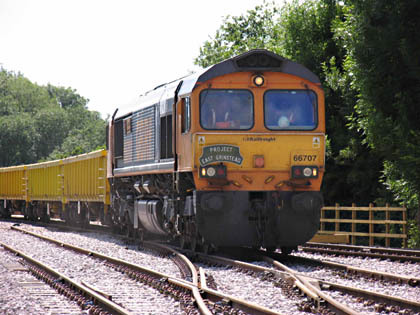 The photos above (all those in this update are from Nigel Longdon) show 66707 ready to depart with the first loaded train on 5th July, and one of the tracked dumper trucks used to load the wagons. 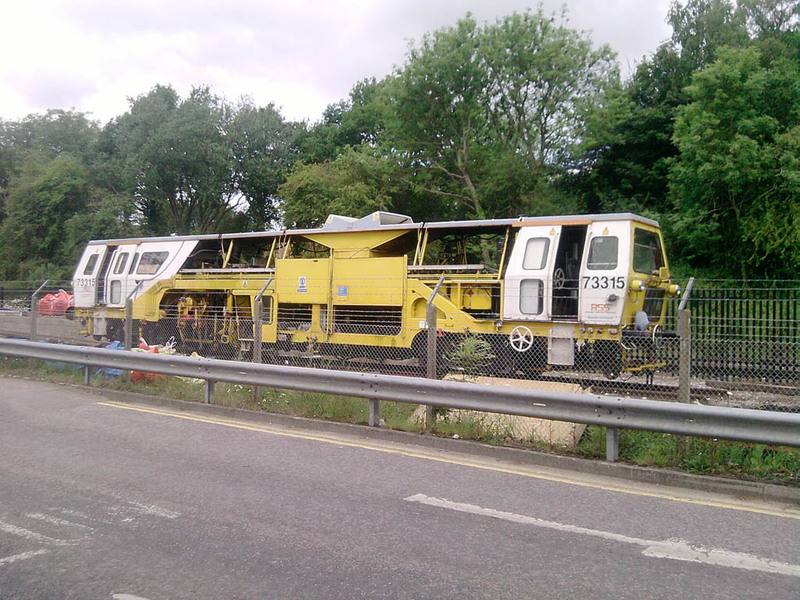 A video from Robert Philpot shows the operation of the digger and dumper trucks at the tip face, one from Matthew Nightingale shows the official launch train on 6th July, and one showing the loaded test train the day before, leaving Bluebell metals for Sutton Courtney. 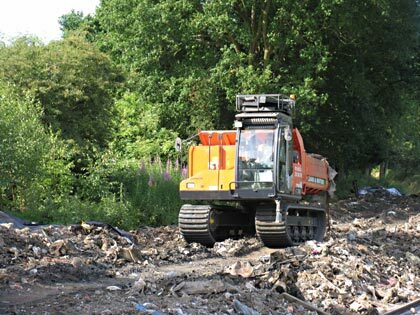 This is how the process went: Having arrived the preceding Saturday, on Monday 5th July half the MLA wagons (nine) were propelled south to the loading area where a stockpile of waste had been gathered and they were loaded. By the end of the week this process had been refined to take about ten minutes per wagon. 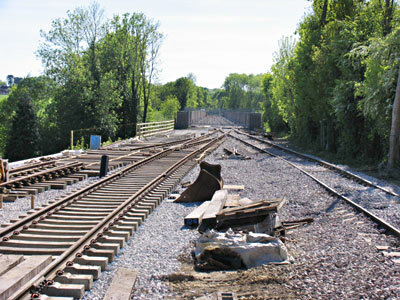 Once the first half of the train had been loaded it was slowly drawn across the viaduct where a temporary weighbridge (photo, right) had been installed. 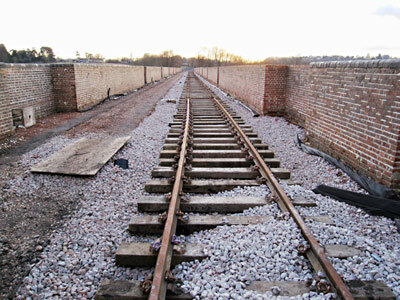 If any wagon was over the weight limit or significantly under then the wagons were returned for their load to be adjusted. 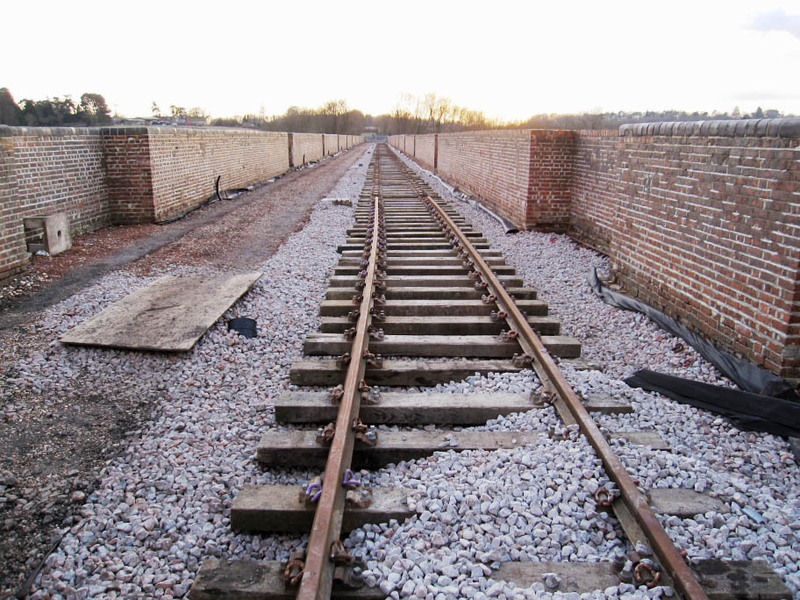 When this part of the operation was complete these wagons were drawn into our platform road and the remaining nine empty wagons propelled south for a repeat operation. Whilst these were being loaded the locomotive returned to our station area to propel the loaded wagons south to reform the train. 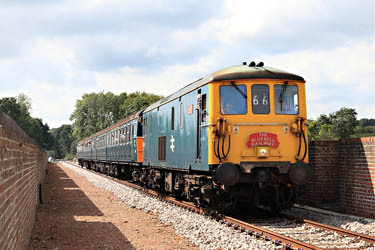 Apart from the first day, the train of empties arrived at about 13:30 and was scheduled to depart at 21:10, arriving at Forders Sidings, Stewartby, Bedfordshire next day at 01:30. After being emptied the train returned on the same timetable. The trial was limited to one week in case there were any major problems encountered; thankfully there were none. 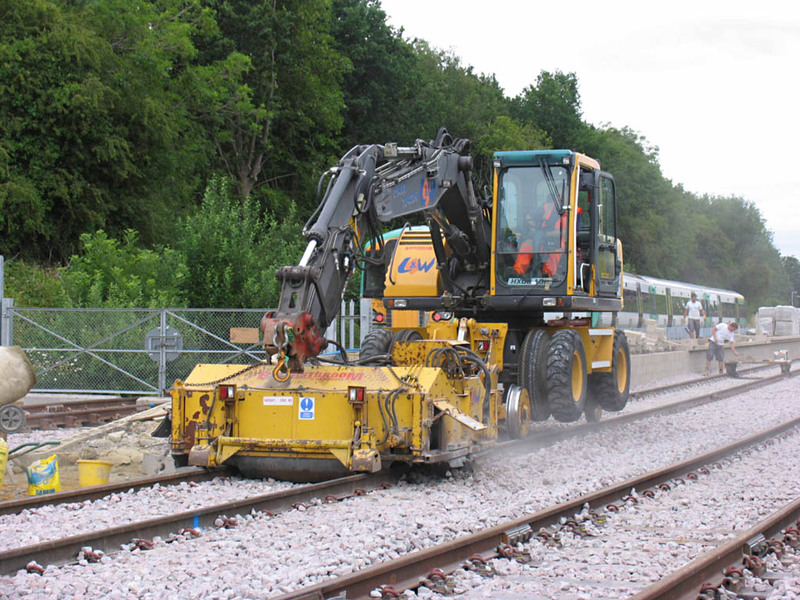 The track has received a final fettling using a brush box attached to the road-rail (KGT) crane (photo below). This device sweeps excess ballast from the sleepers and deposits it to the side of the track - a noisy and, in dry weather, dusty job. 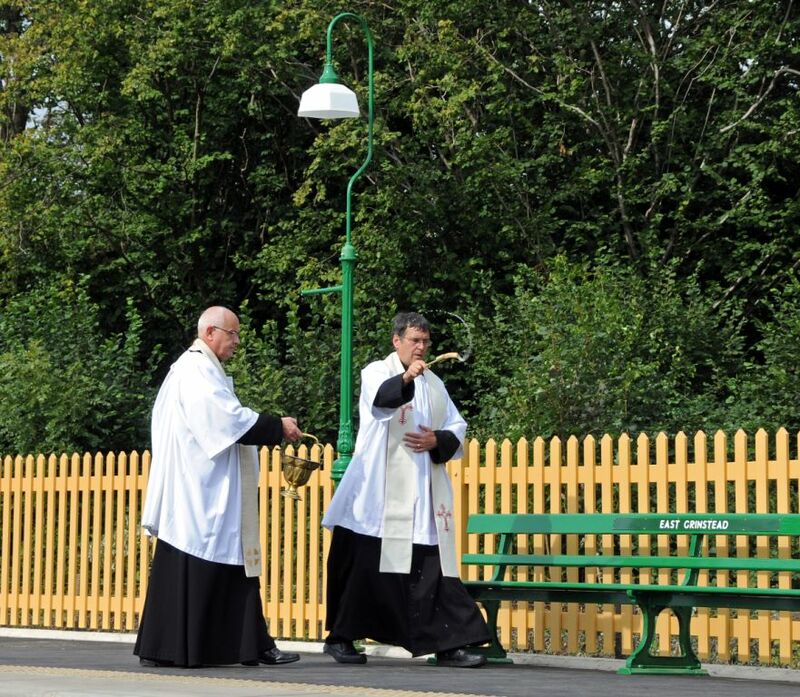 Much time has been spent recently on the platform. 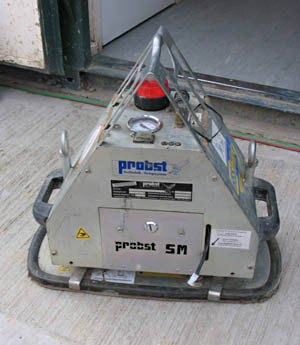 The edging is nearly all in place and was lifted using a special tool (photos below), attached to the KGT, that lifts the slabs by suction. The rear wooden palisade fence, prepared by a team based at Kingscote, is also being erected (final photo below) as the (rail) posts are concreted in position and the surface drainage system is also being laid. 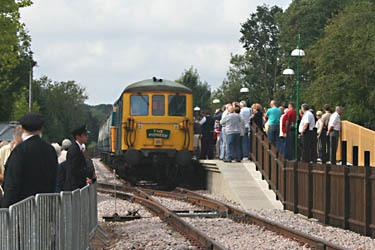 See the new platform for yourself at the East Grinstead Open Weekend on 4-5 September - details above. 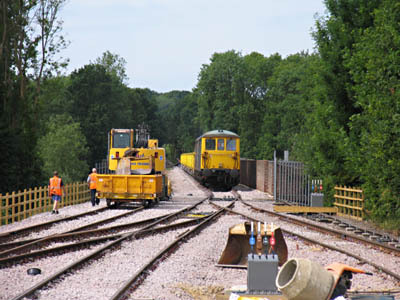 The pilot run of waste removal form Imberhorne cutting by rail is now fixed for July 6th which is very close to the planned opening of East Grinstead station (scheduled for Saturday 3 July) so it has been decided to focus on the long awaited 'Waste by Rail' event rather than the station opening, which will now officially take place in September. 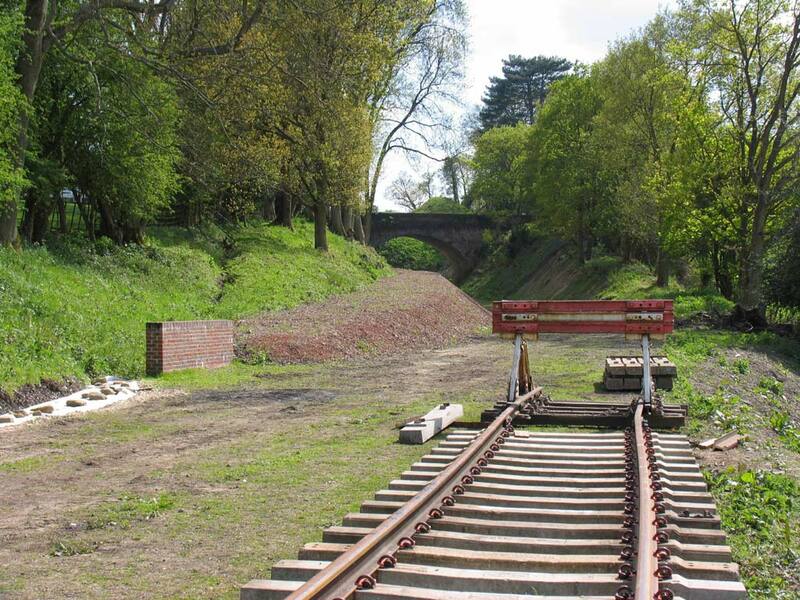 East Grinstead site will be host to the invited guests and the press from 6pm on Tuesday 6th July (entry via north end site gate 1) in order to see the first official train. Members and public are also welcome to attend (£2.00 entry charge in advance) although space is limited at the site so either book early through Sheffield Park Sales and Information office, or entry on the evening price £2.50 if space permits. The site will be open between 6pm and 8pm. Wagons to be used for tip extraction arrive at East Grinstead. Saturday 3rd July 2010 was a special day with the arrival of the first train of empty wagons that will be used for the next trial excavation of Imberhorne waste tip during the coming week. On arrival, the train of eighteen MLA open bogie wagons was split in two; the first half was then shunted into Bluebell's platform line and the locomotives then moved to the north end of the train to propel the train south over the viaduct then the second half was moved onto Bluebell's track and positioned on the run-round line. 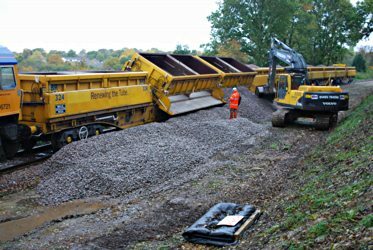 During the course of the week the train laden with 1000 tonnes of waste will depart in the evening and return next day to be refilled. Subject to a successful trial and sufficient funding being available a longer extraction will take place later in the year. The photographs show the train arriving on Bluebell's track and the wagons being shunted across the viaduct. Much has happened since the last update was posted. 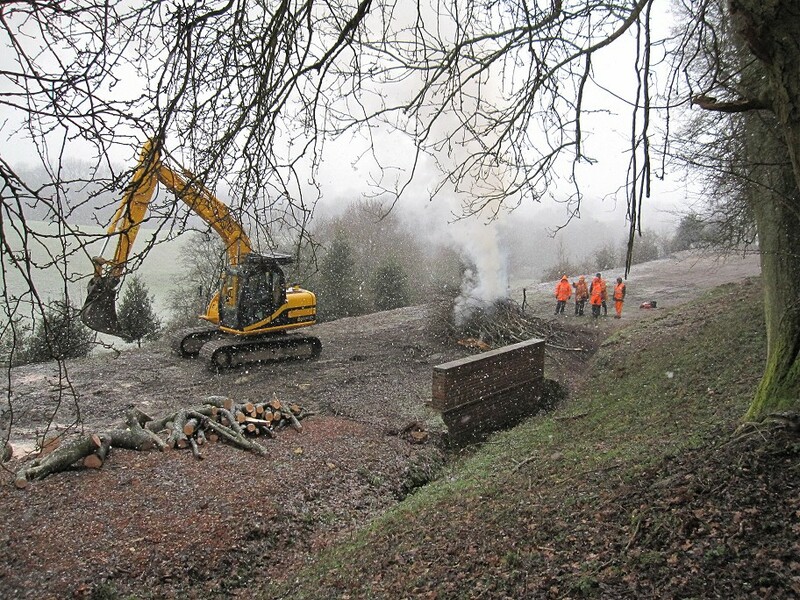 Nigel Longdon's report and photos illustrate the work done over the last couple of months. Track has now been laid south of the viaduct, sufficient to enable the trial waste trains to be loaded, and terminates with a buffer stop. North of the viaduct a great effort was made to complete the track at the south end of the platform ready for the very successful 5-6 June Open Days. 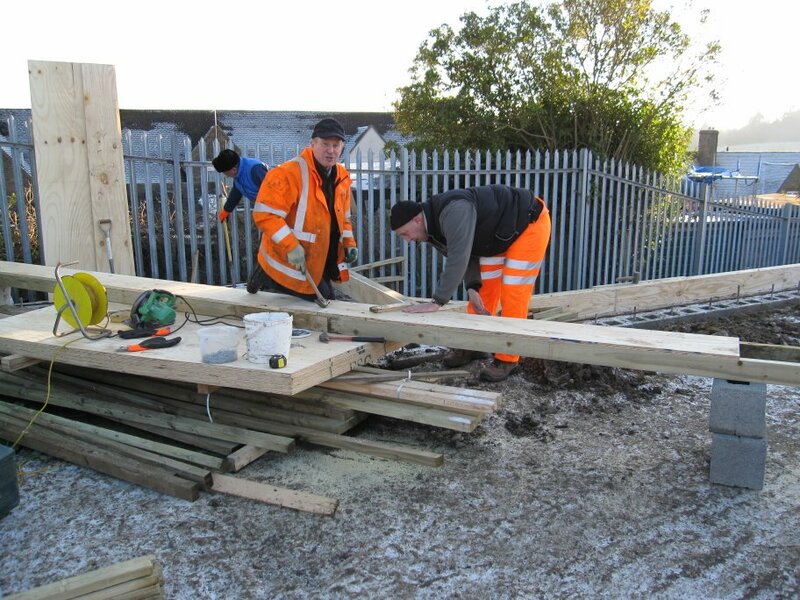 The point work is taking shape. 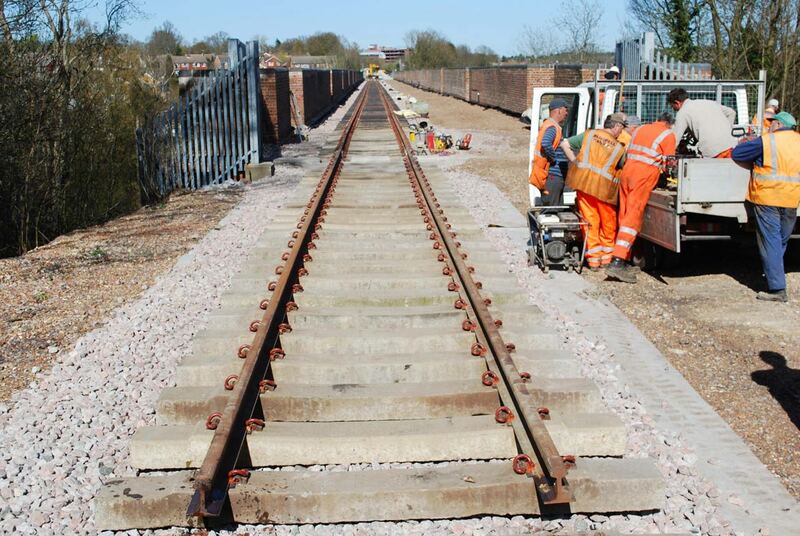 A start has been made in laying track along the platform road. 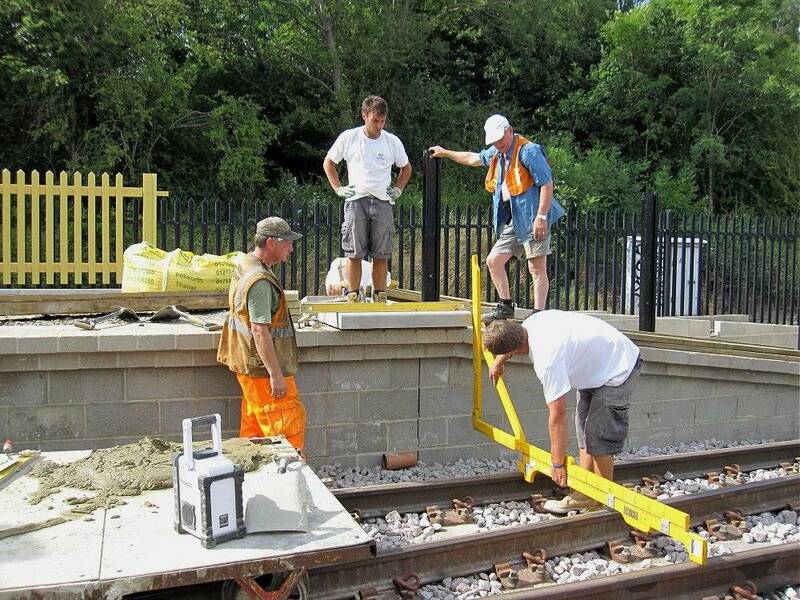 When the alignment has been finalised then the remainder of the front platform wall will be built. 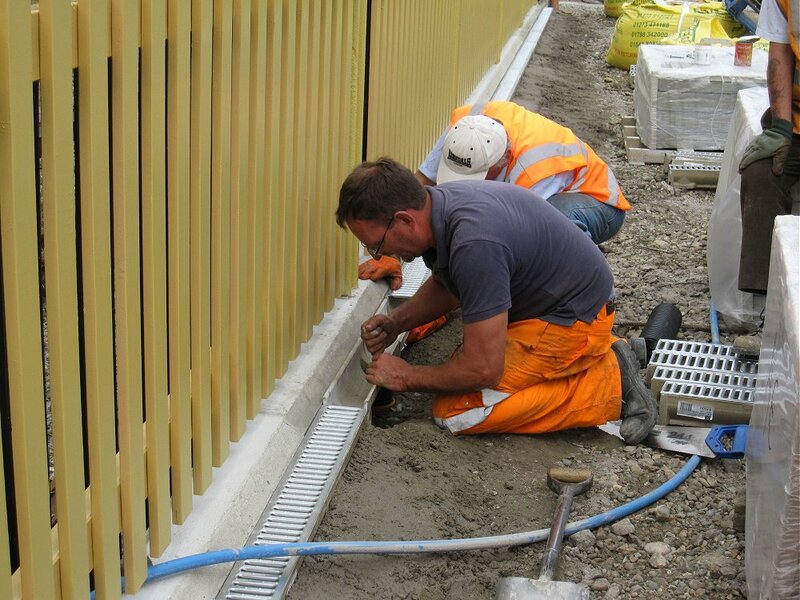 On the viaduct the waterproof membrane is being fixed to the base of the parapet wall using Hilti nails and then sealed with a layer of brick and concrete haunching. 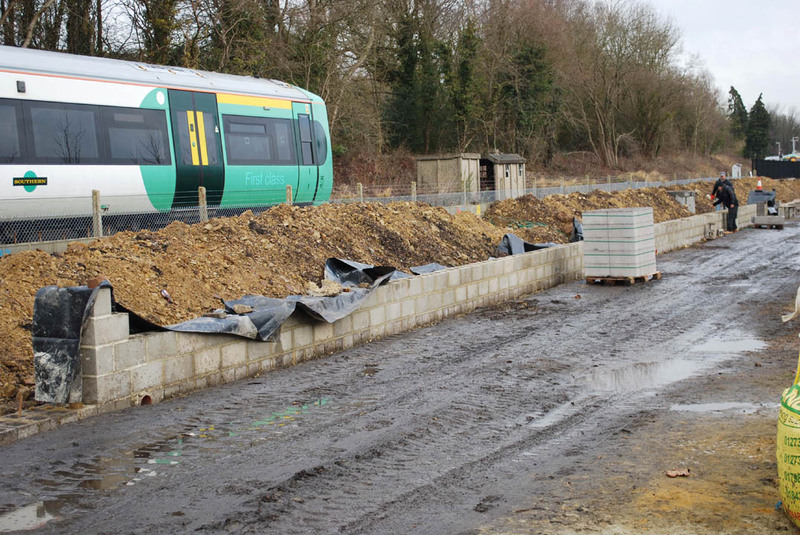 The void between the platform walls is being filled with spoil scraped from the trackbed. 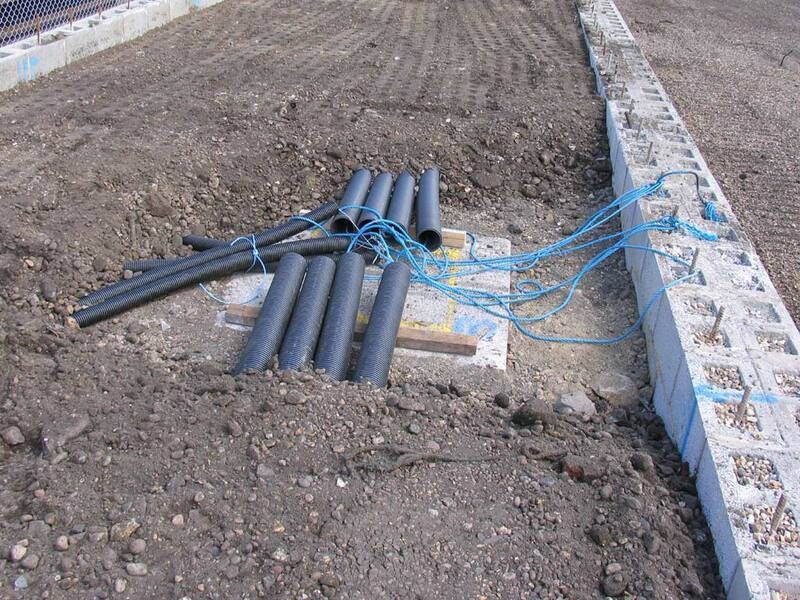 Service duct pipes are being laid and the spoil compacted using a remotely-controlled compactor. Platform drainage is being installed that will drain from the back of the platform out through pipes at the base of the front wall below the ballast and into a central nine inch drain that runs from the south end of the viaduct north to the water tower where it will be pumped into a tank and used to supply locomotives. The large black pipes sticking out of the trackbed (which will be shortened) are access points for jetting any blockages and the smaller temporary black pipes are to indicate the safe route for drivers delivering ballast. The last photo on the right, from Robert Philpot, shows that on 7th June the ballast tamper had arrived to align the trackwork, the laying of which is now complete through the station, leaving just a couple of track panels in the run-round, buffer stops, ground-frames and point levers to be completed to create an operational layout. 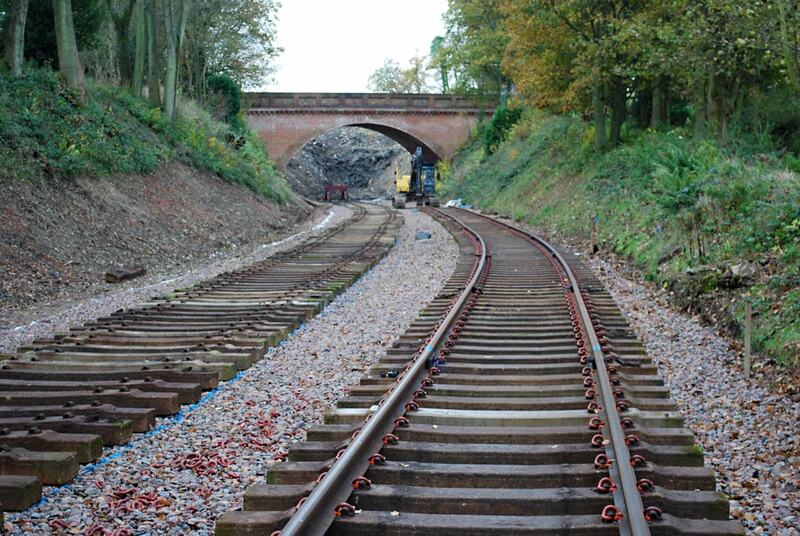 A couple of shunt signals will also be provided soon, worked from the two ground frames being installed. On April 22nd a milestone was reached on the Northern Extension Project: the completion of track laying on the viaduct and the first panel laid south towards the rubbish tip. 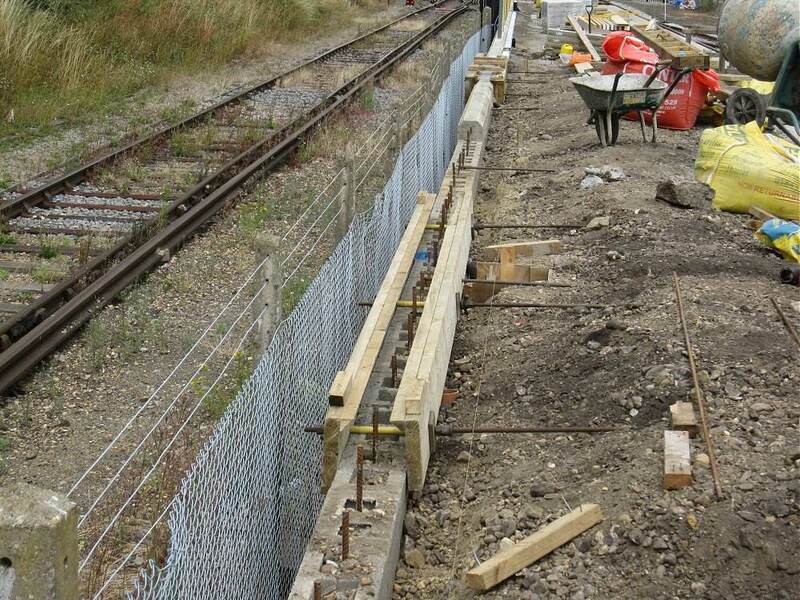 Apart from the transition panel at the south end of the viaduct the sleepers on the viaduct are wooden; south of the viaduct to the tip sleepers will be concrete. 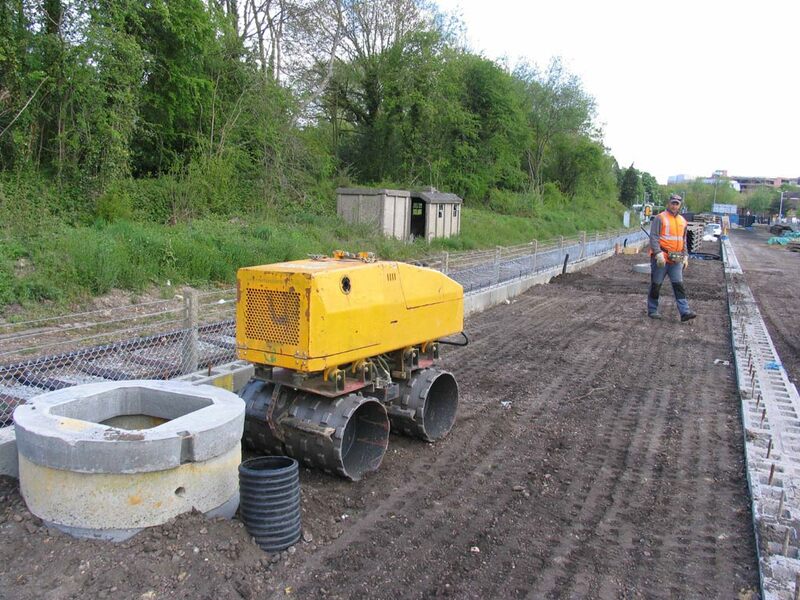 There's still much to do before we can send the first train of rubbish away: track has to be laid to the tip and in the station area, and the platform must be completed as well as control systems for the pointwork. 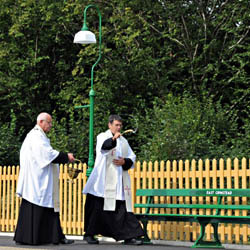 Photo with thanks to Patrick Plane. 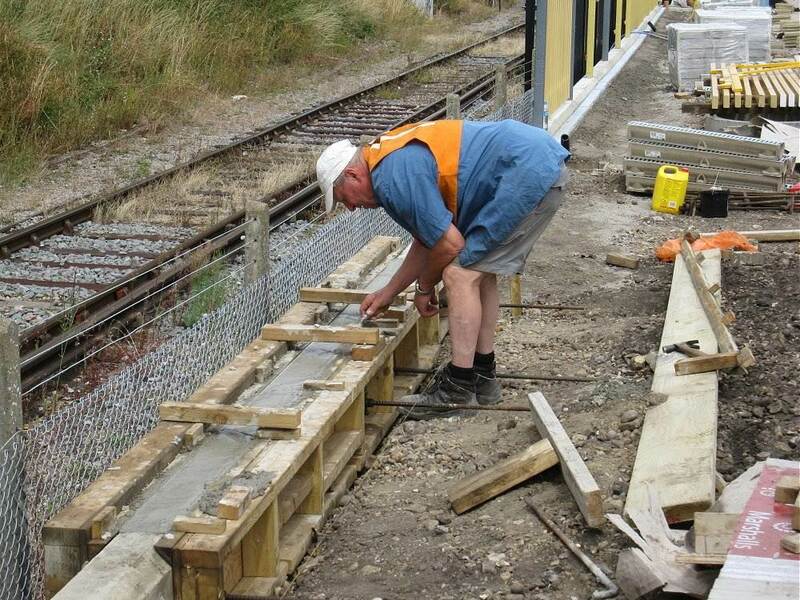 Derek Hayward also has a few photos taken inside Kingscote's south signal box showing extra equipment installed there in preparation for the track north of Kingscote becoming part of the operational line. 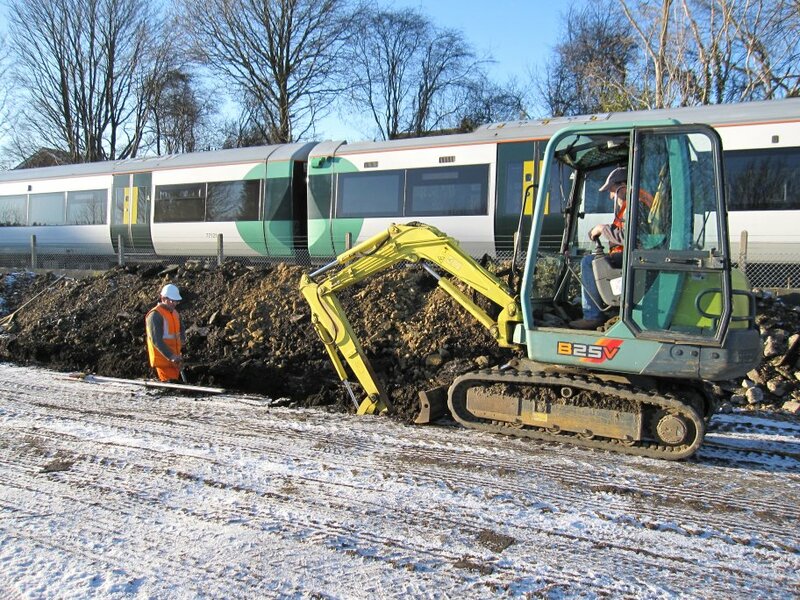 Regrettably the extreme weather over the last couple of months has impacted the Extension Project programme by five weeks, consequently delaying the pilot removal of waste by rail. 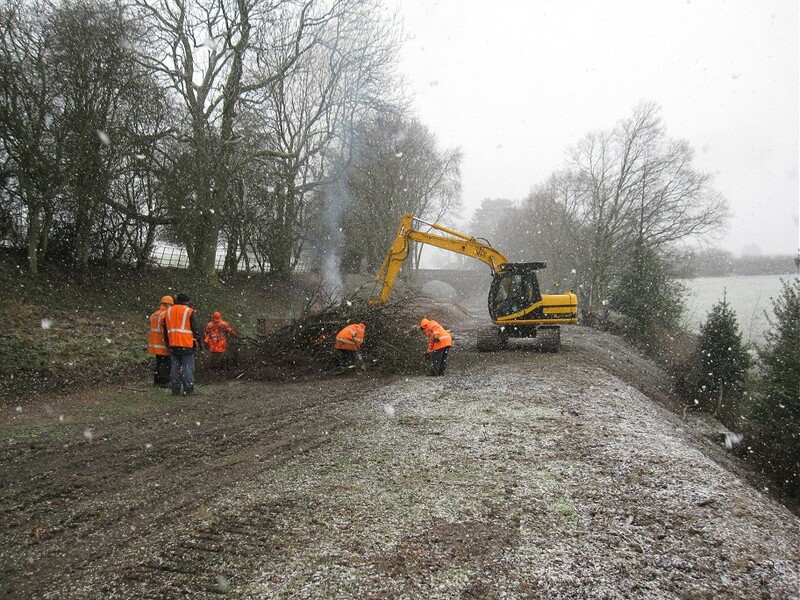 Despite the weather there has still been considerable progress on the project. The footings for the platform front wall have been laid and the wall is being built. 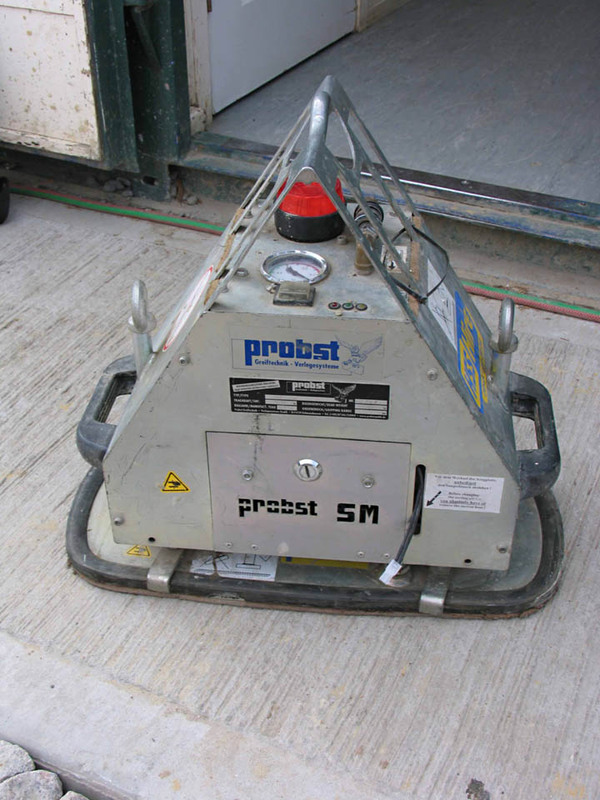 The area allocated for the relay room has been prepared and it has been delivered and craned into position. 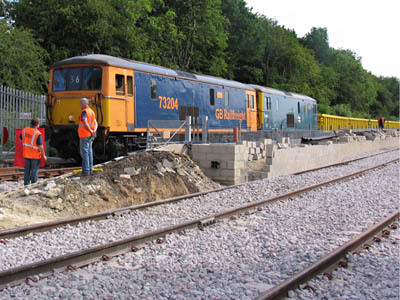 Network Rail decided that the kink in their siding that provides access to our site needed to be eased and consequently we have had to remove the concrete lintel below the access gates and reposition our track, as seen in the rather "interesting" photo from Pat Plane on the right. Network Rail will re-align their track as well! 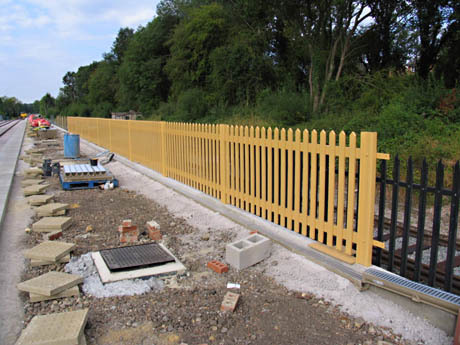 The fence at the south end of the siding has also been replaced with palisade. 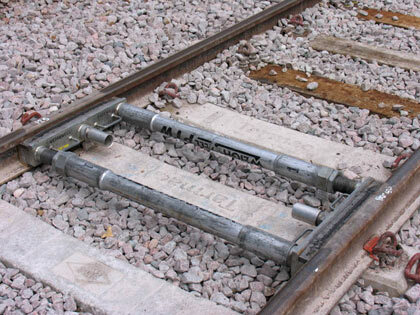 A flaw was found in our point immediately north of the viaduct so the "half point" has been changed and the track removed will be reused at a less critical part of the line. Finally, the good news is that wooden sleepers have been laid the length of the viaduct and the first rails installed. After the schools' half term week attention will switch to the priority project of replacing the track in the tunnel on the existing line, but work will also continue on building the East Grinstead platform front wall. 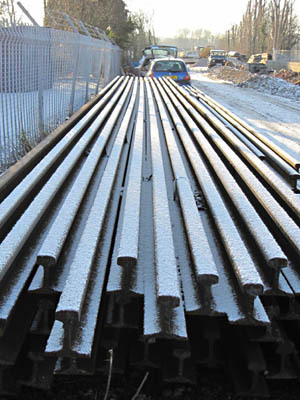 Above: Michael Hopps' photo shows rails now installed at the start of viaduct with sleepers ready for the big push to the tip. 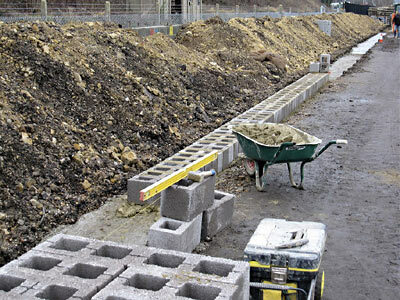 These two further photos from Michael show work in progress at the end of January, with part of the foundations for the front wall of the platform being poured, and the first blockwork for the front wall being laid on a section of the foundations which had previously been completed. The second photo below, from Pat Plane, shows progress in building the front wall as of 12th February. The following photos are from Michael Hopps. 4 January 2010: It had been wet, but now it's a bit frosty! 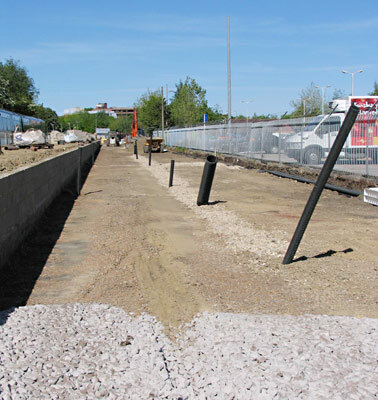 Rails for the viaduct, ready and waiting, and digging the foundations for the front platform wall. Below we see some woodworking going on as the shuttering for the retaining wall capping is nailed together. 20 January 2010: The Wednesday gang, clearing scrub on the embankment between the viaduct and Hill Place Farm bridge. The latest Extension Progress page is here. Archive 2 (April - Dec 2001). 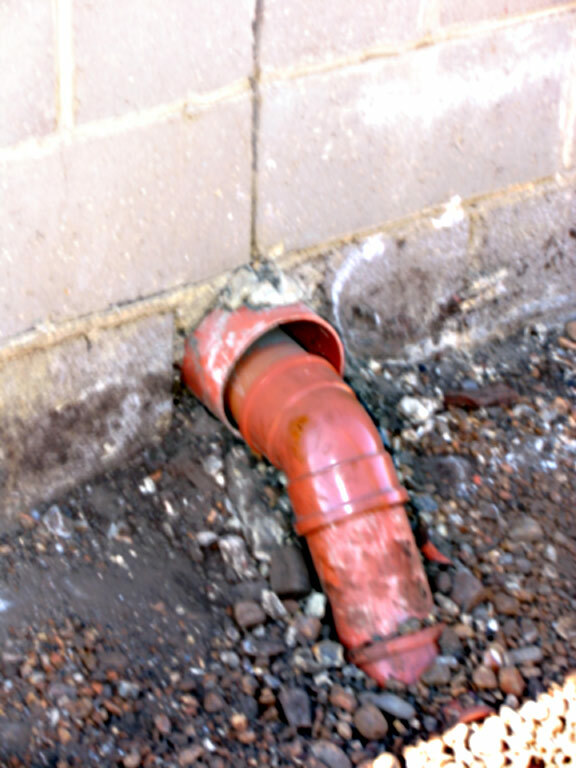 Archive 1 (October 2000 - February 2001). An eariler report on progress (April 2000) from Jim Turtle is in the News Archive. Page maintained by Richard Salmon with thanks to Mike Hopps, Nigel Longdon, Patrick Plane, Robert Philpot, John Sandys, Tony Sullivan, Colin Duff, Ian Hall, Derek Hayward, and Chris White.